Valerie Horn spent most of her career as school counselor in Letcher County. During that time, she worked with the BackPack Program, which provides healthy weekend meals for children. “We had one kindergartener carrying around his backpack all week with a lock on it. That surely speaks to food security issues,” she says. According to the U.S. Department of Agriculture, nearly 50 million Americans experience food insecurity, meaning that they don’t have reliable access to a sufficient amount of affordable, nutritious food. On a practical level, this means worrying about where your next meal — or your children’s next meal — will come from. The causes of food insecurity are complex, including geographic access, affordability and even knowledge of food preparation. These days, Horn works to promote food security in her community as director of the Appal-TREE Project, which stands for Appalachians Together Restoring the Eating Environment, based in Whitesburg. Appal-TREE is a collaborative community research and demonstration project between Community Farm Alliance and the University of Kentucky to increase access to healthy foods in Eastern Kentucky. Mark Swanson, associate professor in UK’s College of Public Health, serves as principal investigator of the National Institutes of Health grant that funds the Appal-TREE project. Other partners include Grow Appalachia, the Cowan Community Center and the Mountain Garden Initiative. Unlike many research projects that require outlining a specific plan to compete for funding, the priorities and scope of Appal-TREE’s work were determined by a Community Advisory Board after the grant was funded. The first year of the grant was dedicated to gathering community input through focus groups with community residents and conversations with key stakeholders. Horn is not new to this type of work. Before Appal-TREE, she worked extensively with Grow Appalachia and the local food pantry. She’s also co-chair of the Letcher County Farmers Market. Last summer, Horn, CFA and the Letcher County School system and the Letcher County Farmers Market began an innovative summer feeding program to provide healthy food options for county children when school is out of the summer. From a booth at the Saturday farmer’s market, the program served free, healthy, local food to anyone under 18. A meal was only $1.50 for adults. When school started and the summer feeding program funding therefore expired, Mountain Comprehensive Health Corp. stepped in to pay for it until the end of the farmer’s market season. These grassroots efforts represent what Horn sees as a growing awareness about local, healthy foods in Eastern Kentucky over the last several years. Collaborating with this existing local momentum and expertise, the Appal-TREE project brings in a research component and additional funding through UK’s partnership. With the guidance of the Community Advisory Board, Appal-TREE will commit the remaining two years of the grant to several key projects, two of which focus on schools. The first is a “water first” campaign to encourage middle and high school students to choose water over sugary drinks. The middle and high schools in Letcher County are being outfitted with water bottle filling stations, and each student will receive a stainless steel water bottle customized with their school colors and mascot. The filling stations will provide filtered water, which Horn hopes will help to increase water consumption by filtering out the high chlorine levels that can give the water a bad taste. Modeled after the Better Bites program in Lexington, the second project will focus on increasing healthy options in school concession stands. Horn acknowledges that one of the challenges will be increasing healthy snacks without disrupting the revenue of these concession stands, which provides funding for extracurricular activities. “We’d like to work with the schools to help them see that at a ballgame, you can still make money selling snacks that are less harmful,” she says. 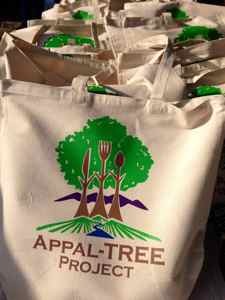 Appal-TREE will also organize six programs of free cooking classes throughout Letcher County. Each program will include six sessions that emphasize healthy food on a budget. Participants will receive basic kitchen supplies like a chef’s knife and measuring cup, key ingredients for each recipe, and a grocery card to use on a grocery tour and meal-planning trip. Local chef Regina Niece, of Four Star Village, will lead the classes. “(Niece) has been a chef/caterer for about 20 years, and just as importantly, she’s been a mother of young children on a budget. If you’ve ever been there, you’ll remember it,” Horn says. Horn knows that food is fundamental to any community, and that there’s a rich culture of cooking in Eastern Kentucky. In nearby Clay County, UK extension agent Lora Lee Frazier Howard also works to promote food security through community cooking classes. In late 2014, Howard was named Educator of the Year, an award exemplified by her commitment to the health of the communities she works with. For the last three years, Howard has presented the Plate It Up Cooking School in Clay County. Each cooking class uses recipes from Plate It Up Kentucky Proud, a partnership between UK Cooperative Extension Service, the Kentucky Department of Agriculture and the University of Kentucky School of Human Environmental Sciences. The project project provides healthy recipes using Kentucky Proud products. Recipes and a seasonal food chart are available here. In each class, Howard demonstrates how to prepare three Plate It Up recipes, sharing the nutritional information and letting the participants taste each dish. The main ingredients are always a vegetable, fruit, or meat that could be raised, produced, and harvested in Kentucky. She says that about 75 percent of cooking class participants keep their own gardens. Additionally, the UK extension service helped to start Clay County’s first farmers’ market last summer. Howard also runs a program called the Art of Canning to teaches families how to can their own food. “Canning is a heritage skill, and there’s a need to share that with people who have never done it before, or we’ll lose it,” she says. “This program allowing families to have access to better food — they know what they’re eating, and they’re learning a new skill. She also hopes that the cooking classes create opportunities for participants to see that what they eat affects how they feel. Mallory Powell is a senior information specialist at the University of Kentucky.